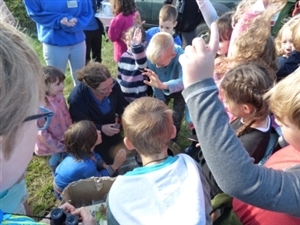 Wild Challenge is a brilliant opportunity for families to connect with the natural world in exciting new ways – to reach out and touch it and meet it head-on, up-close and personal. Our free online Wild Challenge activities are divided into two sections – helping and experiencing nature. There are a range of fun challenges to choose from and bronze, silver and gold awards to achieve depending on how many you complete. Wild Challenge is run in partnership with Aldi, who have donated over £2 million from the sale of their single-use carrier bags in the first two years of the partnership alone! One of the wild activities that you can take part in is going on a ‘Bug Safari’. Some wildlife is so tiny that it’s hard to see. The best way to see it is to bug-out and go out exploring in a world full of tiny creatures - the land of the minibeast! From beautiful butterflies and dainty ladybirds to slimy slugs and impressive shield bugs - no matter where you are, you're sure to have a critter-packed safari. You can find bugs everywhere - under logs and rocks, beneath pots, on leaves, in the grass and on walls. Bug hunting is bags of fun and all you really need are eagle eyes and an explorer's spirit. If you want to take a closer look at your tiny friends, all you’ll need is our minibeast ID sheet, a chunky, soft bristled paint brush, a bug pot (a jam jar is fine), a pooter, a magnifying glass and a camera or pens and paper. Then, you just need to head out into your garden or a local green space such as a park or playing field. The trick is to get to their level - get up close and explore the little dark, damp and cosy nooks that a minibeast might like to call its home. Dark damp spots under rocks and logs are particularly good hunting grounds for things like worms, woodlice and spiders. You'll most likely find critters like ladybirds, caterpillars and aphids on flowers, plants and leaves. If you'd like to take a closer look, use your paintbrush to gently brush the bug into your jar (some of them are pretty quick so keep practising!) This will give you a chance to take a closer look with your magnifying glass, work out what you've caught and take a picture or do a drawing of your find. Remember not to leave your bugs in the jar too long, particularly if it hasn't got any air holes. Always put your bug back carefully where you found it and replace upturned rocks and logs! Want some help from the experts? If you want some expert help to get started on this activity or just want to discover some new species you don't have at home, then why not book a place on one of our reserve Big Wild Sleepout events? You'll be able to tick off several Wild Challenges all at the same time then too! Our Big Wild Sleepout tracking exercises are the perfect opportunity to find out more about the incredible world of bugs and insects. You could go hunting for ladybirds and larvae at RSPB Pagham Harbour, or listen out for rare field crickets chirping across RSPB Farnham Heath. Our Big Wild Sleepout events are once-a-year opportunity to camp out with us under the stars and take part in a whole host of wild activities that can all count towards your Wild Challenge award! Other activities include ‘tracking and signs’, pond dipping and moth trapping. Booking in advance is essential, and for full details of each South East reserve event you can read our Big Wild Sleepout blog or click on the reserve name above!